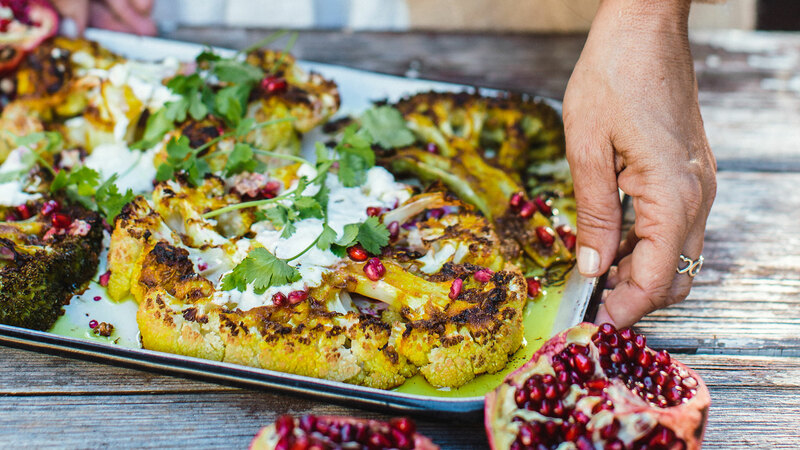 A deeply flavoursome way to dress up your favourite cruciferous veggies. 2. In a small bowl, combine the olive oil, garlic, lemon juice, cumin seeds, ground coriander, garam masala, turmeric, yeast flakes, salt and pepper. 3. Lay the cauliflower and broccoli slices on the prepared baking tray, and brush with the spice mixture, turning over to coat both sides. Bake for 20–30 minutes, until tender. Set aside to cool. 4. Transfer to a plate, top with yoghurt dip and garnish with the coriander leaves to serve. Image and recipe from Supercharge your Life by Lee Holmes, Murdoch Books, RRP $35.00. Photography by Luisa Brimble.